Zippy Junior is one of the most popular children’s entertainers in the North-West. He covers all areas including Hoole and the surrounding areas in Chester. He regularly performs at Hoole village hall. Zippy Junior is a highly professional children’s entertainer, and by using comedy, magic and balloon modelling, he guarantees that your function will be a huge success. Zippy Junior incorporates magic, balloon modelling and a live rabbit into his shows. He can also provide a disco with all of the usual dance routines and party games. Zippy Junior offers 2 main packages, however he can adapt these to suit your requirements and timings. Zippy Junior’s shows are suitable for all age groups and functions. 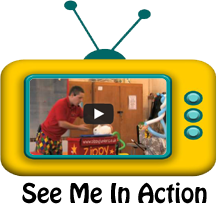 Zippy Junior has many years of experience working as a children’s entertainer. He has an enhanced CRB disclosure, Public Liability insurance and all of the electrical equipment is PAT tested. Zippy Junior ensures to make your child the star of the party, no matter how shy they may be! Zippy Junior uses live animals in his show, and every magic show includes one of Zippy Junior’s 6 magical live rabbits making a special appearance! Zippy Junior has many different packages to suit all budgets and requirements. Please don’t hesitate to contact Zippy Junior today for a fast, no obligation quote. Zippy Junior covers a wide range of functions including birthday parties, carnivals, school fetes, fun days and corporate events in Hoole and the surrounding areas of Chester.